Did you know that humans share a third of their DNA with lettuces? That cockroaches fart every fifteen minutes? And that the average person spends six months of their life on the loo? Or stranger still: that bees can recognise human faces. That the chicken is the nearest living relative of the T-Rex, and that a single human hair can support 3kg in weight! The king of funny facts, Mitchell Symons, is back with yet another trivia-tastic book of would-you-believe-it weirdness! I move this booke i like the other choses of words and how he give the reader a clues. I want to read this book but I dont know were to buy it!!! 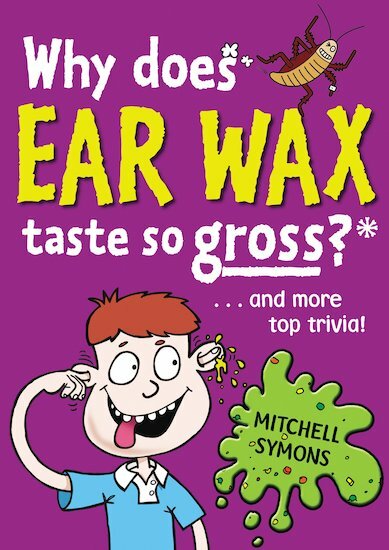 Mitchell Symons writes jaw-dropping, fact-packed books about the weird and wonderful world of trivia, and has twice won the prestigious Blue Peter award for Best Book with Facts. Mitchell Symons has twice won the Blue Peter Best Book with Facts, for Why Eating Bogeys is Good For You and Do Igloos have Loos?.